What makes members of NYPD bomb squad tick? 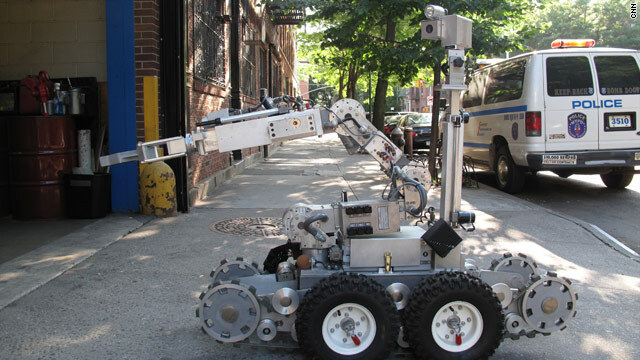 The New York Police Department bomb squad depends on robots to blow up suspicious packages and take photos. Det. Greg Abbate: "There's a very strong bond between us"
New York (CNN) -- Staring down a smoking homemade bomb and dismantling it is dangerous enough. Doing it with news cameras rolling on a busy Saturday night in the middle of Times Square is something Det. Patrick LaScala of the New York Police Department swears never entered his mind. "You're home the next day, and you're really thinking about it. Then, you start to put the pieces together and you think, 'Wow,' " LaScala said in an exclusive interview. LaScala was manipulating the police robot that laid the groundwork for one of his partners, Det. Raymond Clair. "This was the first time that I went down on a vehicle, and I saw clocks and wires and gas and propane. I identified it as a bomb, and I had to look twice," Clair said. After 13 years as a bomb tech, that night was the one Clair says he'll remember the most. Clair and LaScala are part of New York's elite bomb squad, a unit whose size is a closely guarded secret. CNN was given special access to the unit in order to find out what a more typical day can be like. During one recent 16-hour shift, I watched the same five-man team who worked the bungled bomb plot in Times Square check their equipment, catch up on paperwork and make sure Dan-O, their explosives-sniffing dog, was raring to go. The K-9 is named for a member of the squad who died in the 9/11 attacks when one of the twin towers collapsed. On a busy side street outside their Manhattan offices, neighbors watched them go through their paces with the robot. "We think they're great," one man said. Another passerby snapped a picture of the robot with her cell phone. "Is that the robot that checks out bombs?" she asked. It was. But robots, as sophisticated as they are, can only do so much. They're capable of blowing out windows, blasting a suspicious package to bits, photographing an object from several angles and sending those images to investigators. The squad doesn't want to publicize more specific details. Still, a human touch often can't be avoided. With help, bomb techs first crawl into an 85-pound protective suit that covers their bodies from head to toe. The feet nearly look like those of a platypus, the material is stiff and hot, and the chest plate is heavy. A helmet is cinched on around the neck, and an air hose keeps outside air flowing into the mask. Put on gloves, and it's hard to imagine that anyone in such bulky gear could maneuver and dismantle possible bomb components. But that's what they're trained to do. "The more you do, and the more you get involved, the better you'll get when it's the real thing," Clair said. Det. Greg Abbate also was there for the "real thing" in Times Square. He said his training kicked in. "There's a strong bond between us. We go to a job, there's very little talk. Everyone knows what they have to do," he said. Despite the immense dangers associated with the work, whenever the unit checks out a suspicious package, bomb technicians jockey for the opportunity to suit up. "We actually have arguments over who's taking the job," added Abbate. When CNN traveled with them on a call, it was Abbate's turn to wear the gear. The bomb squad was called to check out a backpack found in a park near a police headquarters checkpoint. The team sped to the scene with sirens screaming. Other units ringed the perimeter. X-rays were taken. Abbate moved in. This time, he determined that this time, there was nothing to it. Sgt. John Ryan said it's necessary to assume the worst until the team moves in. "Everything is a bomb until we say it's not a bomb, " said Ryan. The days are long, but the men say they feel "blessed" to be part of the bomb squad. They laugh when people suggest they must be a little crazy to do such a dangerous job. "It's an honor," LaScala said. "At the end of the day, it's just one day down and a lot more to go," said Det. Mike Garcia. CNN producers Julian Cummings and Ross Levitt contributed to this report.